Getting off on the fifth floor of the crowded freight-sized elevator of the New Museum in New York City, I got a flashback to a sensation I have felt many times over the years. Falling somewhere between claustrophobia and disappointment, the sensation in question comes over me when I realize how hard up art really is for space. I remember the first time I had this feeling: it was in Hong Kong, around 2005, and I was searching for a gallery space I had heard about. Located on the eighth or 15th or 23rd floor in a bustling building and district I can no longer distinguish, the exhibition space turned out to be the size of an area rug. This was not uncommon. Hong Kong is hard up for space in general, but the underlying denominator over the value of space carries through to almost everywhere you go. Perhaps this is why I've liked the prairies so much, because of the vastness here. There are issues with space here as well, but it's easier to believe if one space dries up, another opens, because there is just so much of it available. Take another moment experienced, at the soon-to-be-former site of the Whitney Museum of American Art. Curators Dana Miller and Scott Rothkopf have assembled an exhibition around the strategy of space, bringing together a dozen artists from the institution's permanent collection and staging each work in their own room. Calling the show Singular Visions, the works are not necessary cohesive in theme, but concept, culling on meditative works and asking viewers to slow down in how we look, giving each work some breathing room. But it's still New York and it's still the Whitney, and so there still wasn't that much breathing room, but compared to the Edward Hopper show two floors below, where half-a-dozen heads shared viewership over any given image lining the walls, it appears the value of space is all relative. I recently walked through the Brian Jungen exhibition on the top floor of the AGA, a massive 6000 square foot open space adorned with three of Jungen's large plastic sculptures. Only myself, a friend, a staff person and a guard shared this space for the 10 to 15 minutes I was there. 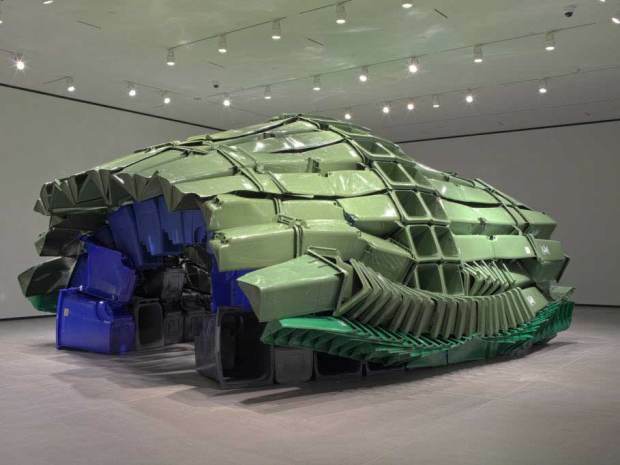 The works ranged in size, with "Carapace" being a shell like structure several people could enter at once. Only, there were not several people in the room to try. I didn't get the sensation that art needed more space, but I felt something similar that's been creeping up, and that it's about having the people as much as having the space. I remember talking to a collective in Saskatchewan four or five years ago that wanted to use the entire province as one enormous exhibition site. The dream was to invite international artists to engage with public sites in the fashion of Münster, Germany. I thought it was a great idea for a residency, but I wondered then who would see it? And how? Space is both inviting and limiting, in what we can do and how we stay connected. These are thoughts I'll continue to ruminate, in another open and remote space, on the other side of the ocean. Thank you for reading. I will be completing an Arts Writing and Curating Fellowship in the North East of Scotland this year. Prairie Artsters in Vue Weekly is now on an indefinite hiatus. Last week in Winnipeg amidst a deep freeze wintry weekend, The Winnipeg Art Gallery in partnership with Mentoring Artists For Women's Art (MAWA) presented Sculptural Vocabularies, Canada's first international symposium on women in sculpture. Presenters included 2009 Gershon Ishkowitz winner Shary Boyle, who's coming off a landmark year in her career with a major solo show touring across the country, internationally heralded Aganetha Dyck, whose art work with honey bees has been revolutionary, Rebecca Belmore, Canada's Venice Biennial representation in 2005 with a body of work that crosses over from performance to sculpture to video, among many more active artists working across North America and Europe. The symposium drew visitors from across the country, with a strong contingent representing Winnipeg's consistently vibrant arts community. Well over a hundred individuals and delegates from artists, curators, writers and administrators registered and attended, and lively debates and conversations were held on the process, possibilities and potential of sculpture and public art. Through it all, it was a great weekend, but a part of me couldn't help but look around Muriel Richardson Auditorium every morning and wonder: why are there less than five men in the whole room? Breaking that five down, at least one was the husband of an artist, one a volunteer, one a father of one of the organizers, and at least one was on the clock. What, if anything, about this extraordinary event kept the men at bay? The symposium was about women in sculpture, but first and foremost, the symposium was about art. I can't imagine such a disparity was mere coincidence. It's not that women in sculpture is an entirely foreign concept, though the field has held a reputation of being a boys' club. The conference was a first of its kind for a reason, as women working in this realm have been far less recognized than women working in Two Dimensional and Performance. There is no clear reasoning, though over dinner with some conference delegates, theories swirled that a permanent feminist public art piece (aside from figurative legacy projects) could not exist as the intention behind public art in all its reinforcement of power and structure is antithetical to feminism. It's been 40 years since the radical rise of politically engaged feminists in the art world. That era has been historicized as a story from the past, through exhibitions like WACK! and by thinkers who think we are now post-feminism in the creation and exhibition of contemporary art. But the numbers haven't changed. Artists who are women are still consistently receiving less exposure than their male peers in solo exhibitions in galleries and museums, across the mediums, even though enrollment by women in art schools has exponentially skyrocketed over four decades. While most artists I encounter do not relate to the label of "feminism," and admittedly that is a term I have wrestled with myself, the momentum of discourse continues on whether or not we personally identify with it. You don't have to be a feminist to engage, enjoy or even like art made by women and you don't have to be a woman to engage, enjoy, like or dislike art made by women. But you have to see it to decide for yourself. Art, on some level, is still about communicating a human expression unheard through any other means, and it's amazingly disappointing to see the disregard we still have when it comes to hearing what we all have to say to each other.